Texas Freckles: A quick trip north. I didn't intend to neglect the blog for so long. There hasn't been much sewing going on around here. Lots of knitting and a little embroidery, but nothing to share just yet. It was 83° here yesterday. On the first day of winter! Ugh! I did get to enjoy some cold weather on a quick trip I took to Milwaukee this past weekend. The temperature never got above 23° the entire time we were there. One of my best friends is leaving Texas for a job in Milwaukee and I joined her for a weekend of apartment hunting. I had never been to Wisconsin, and I have to be honest, the only thing that came to mind when I heard the word Milwaukee was Laverne & Shirley. But, Milwaukee is awesome! She's going to live in the downtown area, which I thought was clean, friendly, and cultural. Fabulous museums, wonderful food (I recommend the new Glorioso's grocery for lunch and the Pasta Tree for dinner), great shopping, and beautiful architecture. It was the first time in my life I had ever visited a beach where the sand was covered with snow and there was ice at the water's edge. This was at Bradford Beach on Lake Michigan. 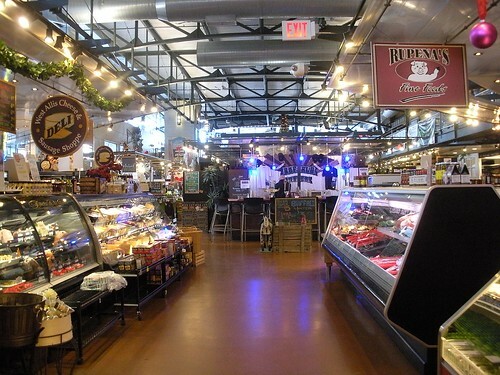 We made more than one trip to the Milwaukee Public Market for lunch, coffee, and yummy sweets. Again, highly recommended. I'm off to finish my Christmas shopping. I think I put it off intentionally because I actually enjoy that last minute pressure. Shop on! Snow on the sand...awesome. We spent the weekend on the central coast of California where it rained buckets and the tide was the highest I have ever seen. Wait until January--I'm sure you'll be reading about mudslides in California, always a bummer. Happy holidays and merry shopping! Yes, it was nice and warm for me too. I'm so glad I moved south. I had my share of snow and ice when I grew up in Minnesota. Now the temps have dropped quite a bit today, and the 80s are gone.. but it was sure nice yesterday! Glad you had a fun trip and we missed you at the Saturday sew. I grew up in Milwaukee, so it makes me happy to hear you say you liked it there! 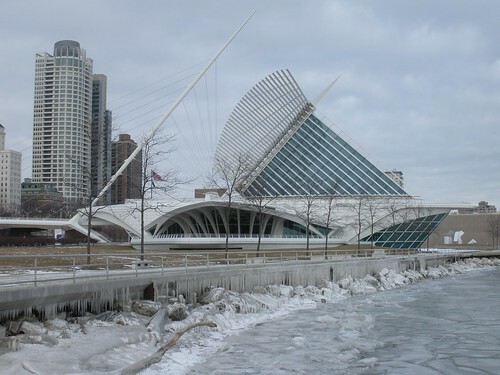 I love Milwaukee, and feel homesick every time I visit my parents (even though I only live in Madison - 90 minutes away). You got to see just the right things to experience the city. Happy holidays to you! Hello Melanie! I've stumbled across your blog and its lovely. I don't quilt myself (yet), but I have enjoyed browsing through. The colors and patterns are so fun! Congrats on your new home. I'm not sure what part of Texas you're in, but I'm in the DFW area. Maybe we are neighbors! Merry Christmas and Happy New Year! Hey fellow do. Good Stitcher ~ I live just west of Milwaukee in Wauwatosa. Looks like you hit a lot of the highlights in Milwaukee. Isn't the Art Museum breathtaking? My husband and I were just wondering whether the Pasta Tree was still open...I guess it is. It's the ultimate "date" restaurant. In a few days there will be all kinds of crazy people taking the polar bear plunge at Bradford Beach. Brrr. Glad you enjoyed your stay.